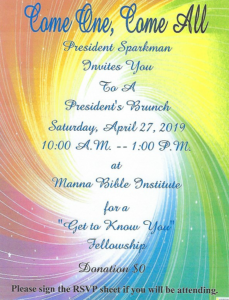 All Manna Students: Reserve your place today for President Sparkman's "Get to Know You" Fellowship Brunch on Saturday, April 27th. Click on "President's Brunch" announcement below to reserve your place. Registration for Spring Semester Classes – Tuesday, January 22 – 6:00 to 8:30 p.m.
Late Registration – Thursday, January 24 – 6:00 p.m.
Thursday Classes begin – Thursday, January 24 – 6:45 p.m.
Tuesday Classes begin – Tuesday, January 29 – 6:45 p.m.
School of Advanced Biblical Studies – 1st Module – “Teaching Clinic” begins Tuesday, January 29 – 6:30 to 9:30 p.m.